The first qualifying session for the 2016 Isle of Man TT Races fuelled by Monster Energy takes place this evening. The solo and sidecar newcomers will be out first onto the TT Mountain Course for their speed-controlled lap, which is scheduled to get underway at 6.20pm (GMT). That is followed by a session for the Monster Energy Supersport and Bennetts Lightweight classes, which will also include solo newcomers. All of the leading riders will be on the course for the 600cc session, although the 1000cc Superstock and Superbike machines will get their first outing on Monday evening. 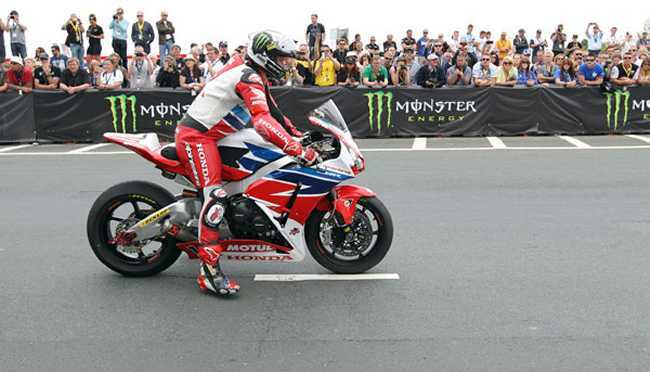 John McGuinness raised the bar last year when he won the PokerStars Senior Race on a Honda Superbike, which included a lap record of 17m 03.567secs, at an average speed of 132.701mph. The 23 TT race winner thinks he can go even faster this year. Last year marked a return to the big time for Ian Hutchinson and you’d be hard-pressed to find a more popular winner than the Yorkshireman after his well-documented recovery from injury. That moved Hutchy’s tally of wins around the Mountain Course to 11, equal with another of the pre-race favourites Michael Dunlop. All eyes will be on Bruce Anstey’s Valvoline Racing by Padgett’s Motorcycles Honda RC213V-S which will get its first outing in Monday’s session. The sidecars will get their first proper look at the Mountain Course in Monday night’s session and it could be one of the more open races in recent memory with seven former race winners returning to the TT Mountain Course in the line up. 17-time TT winner and outright lap record holder Dave Molyneux now reunited with former passenger Daniel Sayle will start favourites. The duo last competed together in 2009 and with Sayle having eight wins of his own, they’re arguably the team to beat. There are plenty of outfits who will challenge the Manx pair, none more so than the Birchall brothers, Ben and Tom, the second fastest crew in history, who did the double last year., John Holden who took his 12th and 13th podiums in last year’s races with Sayle in the chair, is reunited with regular passenger Andy Winkle. Holden will be looking to take his second TT win. Kent’s Tim Reeves, with Patrick Farrance on board again, is another potential victor while 2014 race winner, Bradford’s Conrad Harrison, has a new passenger in Dean Kilkenny. Roads around the T.T. Course will be closed at 6pm but the Mountain section from Barrule Park, Ramsey to the Bungalow shuts at 4.45pm and the section to the Creg-ny-Baa at 5pm. You can follow all of the qualifying and racing around the Mountain Course via the live timing and live Manx Radio commentary which is available via iomtt.com.